Remember, we are meditating on the Beatitudes with our weekly memory verse(s). Ok, Girls - - let's rest here for a while. This scripture feels just like a warm blanket during our very toughest days. 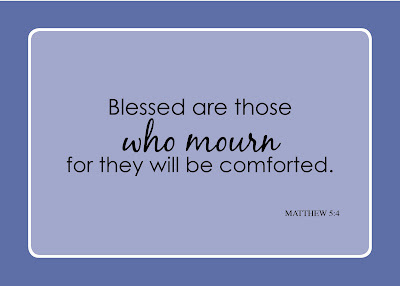 It also helps to ease our deep concerns for the ones we love who are mourning heavy losses (whatever they may be). When we hear this verse are we struck by the emphatic, absolute tone? Jesus does not say, we might be comforted. No, our promise is that we WILL BE. Don't you love to have that special friend on which you can count? She says she will be there and you have no doubt that she actually will. Friends, is there anything better than this? How about a Savior who says - I WILL BE THERE, in your darkest hour - to comfort you. Take His hand, the strong, nail-scarred one that is reaching out to you. He longs to comfort us and be our "Person". What a steadfast promise we have from our loving Savior!